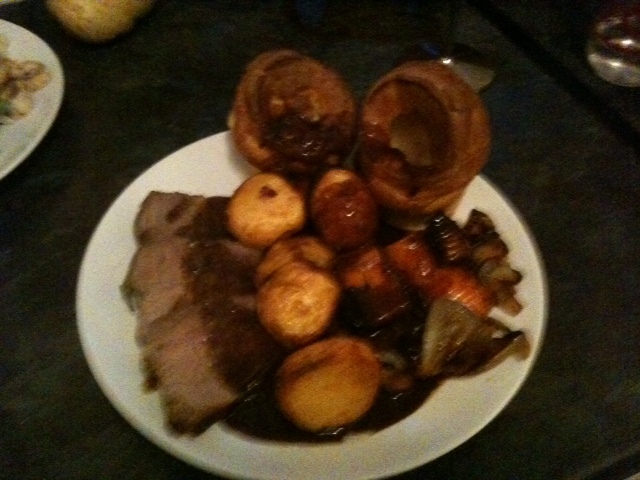 A modest helping of roast beef, roast potatoes, Yorkshire pudding, veg and red wine gravy. … and ended up with food once more! To tie the subject in with my alleged blog main theme (weddings, those of you have kindly signed up to follow me regularly – and I do think you are the most wonderful specimens of humanity – may note that this blog uses the theme of ‘wedding’ very loosely) I thought I’d blog this time about cooking for your intended. Now, I adore food – to eat, to read about, to watch on TV. But I am the world’s most boring eater. I tend to eat the same thing day in, day out. If you are what you eat, I am a mixture of houmous, prawns, salad, bananas and cheese. Ooh, and er… red wine and a wee bit of chocolate. I read recipes, I explore cookery websites, I flick through cook books in WH Smith as I while away time in train stations, imaging how I would improve dishes etc etc. And all of this activity is wasted on moi – as I am le mangeur ennuyeux** and too terrified to venture outside of my eating comfort zones. Happily though, my fiance loves being experimented on so I get to explore my creative side without having to throw out loads of food. So, on Saturday evening, in deeply traditional fashion, I thought I’d cook up a proper roast dinner. Namely, the roast beef of old Scotland. *** Meat in a hot oven! Potatoes in goose fat! Yorkshire pudding! Proper gravy! *I apologise for the word ‘regularity’; it sounds unfortunately too close to what people use as descriptions for their bowel habits. **Literal translation – ‘boring eater’. Not entirely sure if it should be masculine or feminine. ***Delia Smith refers to it as the roast beef of old England; our beef was definitely Celtic.